There are few entries in the Mega Man franchise as obscure as The Misadventures of Tron Bonne. Mega Man Legends is something of a cult classic, but it was never exactly as popular as the original series or Mega Man X. 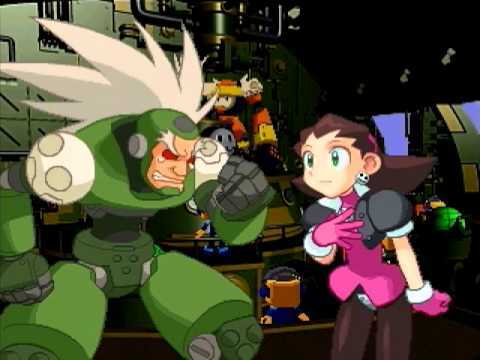 A spinoff of Mega Man Legends starring the game’s antagonists released mere months before Mega Man Legends 2 with very little fanfare was therefore never going to be a very big hit. That’s unfortunate, because there are also few entries in the Mega Man franchise as fun or original as The Misadventures of Tron Bonne. The Bonne Family is a band of pirates that includes not only Tron, but her older brother Teisel (the leader of the gang), her younger brother Bon, and Tron’s forty Servbot henchmen. While the Bonnes played the role of comical antagonists in Mega Man Legends, here they’re depicted as more sympathetic anti-heroes. As the title suggests, Tron is the star of the game. The Bonnes have recently finished construction on their new airship, the Gesellschaft. Unbeknownst to the rest of the Bonnes, Teisel financed the Gesellschaft’s construction with the aide of a loan shark named Lex Loath. Teisel owes a debt of one million Zenny to Loath, but before he and Bon can nab a treasure that will pay off his debt, they are kidnapped by Loath’s right hand man, Glyde. Tron and the Servbots then make it their mission to collect the one million Zenny to pay back the debt and rescue Tron’s brothers. It’s a fun, simple story that really shines thanks to how entertaining the characters’ personalities are. 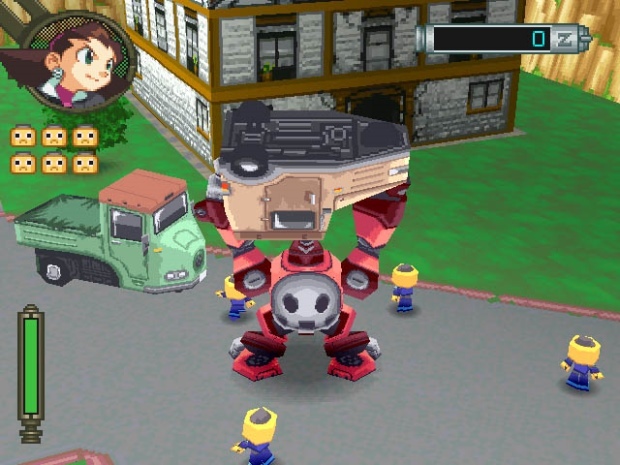 What really makes The Misadventures of Tron Bonne stand out, however, is the gameplay. 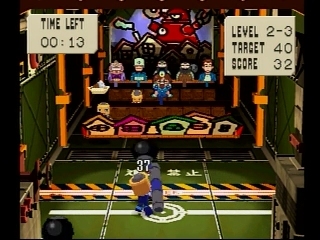 The game uses a similar setup to Mega Mans 7 and 8, with a quick introductory stage leading into selectable stages (four to start with, with two additional levels unlocked later). These stages take on three different gameplay styles. The first style sees Tron piloting her mecha suit, the Gustaff, in action-based stages. 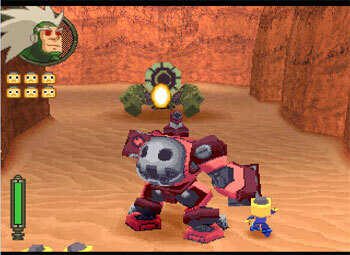 She is accompanied by six Servbots of the player’s choosing, with a seventh Servbot serving as a “sniper” to help power up the Gustaff’s weaponry. These stages play similarly to Mega Man Legends, as Tron navigates 3D environments and destroys everything in sight to collect Zenny. Puzzle stages see Tron piloting a weaponless version of the Gustaff, where she must lift giant crates from a grid-like dock and place them onto a ship. These stages can be real head-scratchers, as the Gustaff can only move a certain amount of spaces on the grid when carrying crates. Finally, the RPG stage is played in a first-person perspective, as Tron remotely controls a small robot and commands three Servbots as they navigate caverns, talk to local Diggers, fight enemies, disarm traps and collect treasure. Every level in the game has three missions, with one of the game’s drawbacks being that completed missions can’t be replayed in the same playthrough, with the exception of one of the action stages that sees Tron making return visits to ancient ruins with Metroid-esque exploration (this stage doesn’t have multiple missions as it requires players to progress incrementally). The three play styles of stages are all fun and give the game a unique sense of variety as it meshes genres together. But it doesn’t end with the levels. In between your missions you get to spend some time on the Gesellschaft, and this is where things get even more interesting. Aboard the Gesellschaft, Tron can not only communicate with all forty Servbots within the ship’s various chambers, but talking to each one of them unlocks new features within the game. Most of them have a special skill, whether it’s combat related (like grenades or slingshots) or focused on improving the Gustaff. Some Servbots have unique skills, with one simply painting the Gustaff different colors while another changes the background music in the Gesellschaft, to name a couple of examples. These skills are unlocked in various ways. You can find special items on missions or from talking to certain Servbots, and giving these items to other Servbots will unlock their abilities. Others will need to have their stats trained to a certain point in order to realize their skill (strength and speed are improved in mini-games aboard the Gesellschaft, while a Servbot’s “brain” stats go up when they go on missions with the player). The Gustaff can also gradually be upgraded with new armor and even a couple of weapons by finding materials within the game’s stages and finding the right Servbot for the job. New areas of the Gesellschaft are also unlocked as you progress through the game or when certain requirements are meant, and you can send up to three Servbots at a time to go on scouting missions, where they can retrieve more items. You even have the option to select a favorite Servbot, which has an impact on the game’s finale. The interaction between Tron and the Servbots, as well as leveling them all up (which is optional) adds a whole new layer to an already versatile game. By the end of it all, Tron and a team of fully-trained Servbots can feel next to unstoppable. Being a PSOne title, the graphics have understandably aged a bit, but the anime-inspired character designs and colors prevent it from looking too much like a relic. 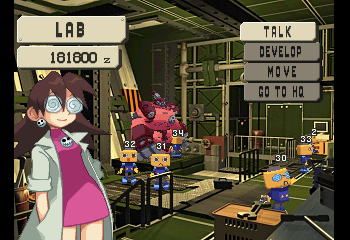 One way in which the game has benefitted with age is that the dialogue between characters is displayed through animated character windows. At the time, it was probably a sign of the game’s relatively small production values, but the character windows are certainly more fun to look at than most of gaming’s cinematics from that generation. The music is another highlight. Although it’s never been acknowledged as an all-time great, I’ll happily say that the soundtrack to The Misadventures of Tron Bonne was one of the finest in the Playstation’s library. It’s certainly one of the most energetic and fun. The icing on the cake are the characters. The voice acting is appropriately animated and lively (Teisel is particularly hilarious just to listen to), and each character has a great deal of personality, from rambunctious Tron herself to snidely Lex Loath. Even the minor characters you run across add to the game’s sense of humor and overall character. Few games are swimming in so much personality. I hate to admit it, but The Misadventures of Tron Bonne does have some drawbacks. The inability to replay missions is a bit disappointing, especially once you’ve built up the Gustaff and your Servbots, as you may feel you don’t have enough chances to show off what you’ve worked for. The aforementioned mini-games used to boost a Servbot’s stats, while fun, are ridiculously hard in their highest difficulty. That might not seem too bad at first, since the mini-games are just fine in lower difficulty settings. But if you want to max out a Servbot, you’ll need to play the highest difficulty, and it can get frustrating (the speed-based mini-game in particular requires almost pitch-perfect execution in order to succeed). Then of course, there’s the camera, which can become bothersome at times. The RPG stage, though a personal favorite, is especially affected by the aged camerawork due to its cramped spaces, tight corridors, and first-person view. When all is said and done though, the good far more than outweighs the bad. The Misadventures of Tron Bonne is simply a delight to play. Even today, I can’t say I’ve played too many games that feel as unique in their execution. It’s a wonderful clash of genres that tie together in a way that’s all its own. And it’s brought to life by a consistently entertaining cast of characters, a fun plot, and a sharp sense of humor. You’d have to be Lex Loath himself to not get a kick out of it.